When the era of all-touchscreen smartphones began in ye olden days of 2007, screens were smaller: holding the phone in one hand, your thumb could reach (almost) any corner of the screen. But now the trend is toward larger screens - and since people still prefer one-handed use, mobile OS and app designers need to accommodate the limitations of real-life thumbs. 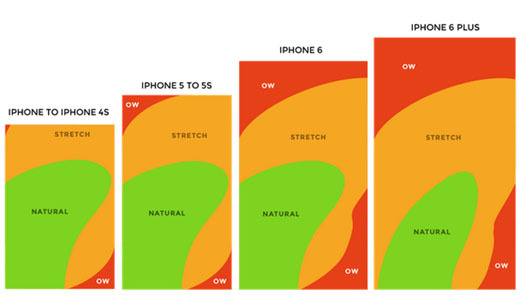 Mobile developer Scott Hurff has a wonderful summary of this new reality, mapping the comfort zones of different touchscreen sizes and exploring the design features that fit them. It's worth a look - you'll realize that you can't simply make a phone bigger to make it bigger, or you'll end up with some very unhappy thumbs!